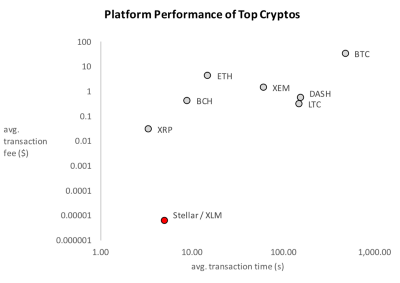 In January Christian from Stellar published “Stellar and the State of Cryptocurrency“ (check out here what Stellar is). They reported on their transactions per second (TPS) and transaction fees (tf). TPS, although relatively high, are still below current industry standard (e.g. Visa with around 2k). Also, according to them, they have the lowest average transaction fees compared to selected other cryptos. will make the difference between winning and losing. Whereas one must take that statement for what it is — a statement — and results speak louder than words, I consider the mere fact that they are talking about marketing positive because it is important, especially because diffusions of cryptocurrencies consists of two mental steps. As a side note, one of Stellar’s marketing metrics — r.p.w. (randos per week) — is mooning (at least in theory). Check out “Thoughts on Stellar’s 2018 Stellar Roadmap” for more on that. Stellar merged several Go repositories into monorepo and there were 128 merged pull requests in 2017. Whether this is a lot is up to you, to me, however, the number doesn’t matter as it makes one confuse activity with results. And only the latter matters. XLM support added to Ledger Nano S: Given all the issues around exchanges that’s one of the most important technical updates. Unfortunately, I haven’t followed Stellar for too long so cannot adequately judge their reporting, but so far I believe they were able to strike a decent balance between increasing trust and transparency without creating unnecessary pumps or an over-focus on prices (see Avoiding, Reporting, and Shilling: Three strategies towards crypto partnership reporting for more on partnership reporting). Anyway, they have added 26 news partners. Unfortunately, as they do not specify their nature fully it is difficult to judge their importance. In the case of SureRemit, for instance, it was “only” an ICO done on Stellar. Whereas an ICO is not necessarily a bad thing (but neither always a good thing, see below) it has less importance than, for instance, the partnership they have with Tempo (see below). Furthermore, it would be interesting to know how these partnerships came about, i.e. whether they were pushed (Stellar engaging with companies to make it happen or even actively approaching companies) or pulled (entities implementing Stellar without Stellar’s involvement). This distinction is important because the former requires more work from Stellar’ but could yield significant partnerships. Contrary, in the latter case Stellar has no work and it demonstrates that Stellar has reached a degree of brand awareness and trust (“momentum”) high enough for others to come on their own. That being said, one concrete partnership Stellar mentioned was with Tempo. Stellar was very happy about that partnership because it was the first EUR-based remittance service using Stellar. Besides that, from the public’s perspective most note-worthy was the partnership with IBM in 2017. Initially, Stellar will provide the network and digital asset to facilitate the settlement of transactions cleared on Hyperledger — Source IBM. Besides that, there are two other interesting aspects, Technical forward-integration threatening Stellar’s USP, and the IBM partnership representing an example for a socio-technical system. I do not know what IBM’s Blockchain and IBM itself is capable of but I think it is important to keep in mind that they — or anybody else for that matter — could implement “Stellar” into their own platform, especially as it is open-source. This once again highlights the importance of timing and user acceptance mentioned above. With IBM and Stellar, both characteristics are observable. Stellar has become the foundational technology for IBM’s remittance solution and only through that Stella’s revolutionary power was “unleashed”. Furthermore, Stellar only “unfolds its potential” when coupled with other technologies, in this case with IBM. I am not saying that Stellar in itself isn’t potential, and “revolutionary power” is a blatant exaggeration, but I still take the view that IBM’s solution provides a nice way to look at Blockchain’s potential and how it might unfold. They recapped on Mobius and Smartlands being the first to do their ICO on Stellar. Regarding ICOs on Stellar, I share the common belief that they will be positive for the platform. However, I am cautious about quantity vs. quality because I can imagine that a range of „bad“ ICOs will cause the opposite. Admittedly, for Ethereum, which has had its fair share of “bad” ICOs, no negative impact was perceivable so far. Furthermore, most “bad” ICOs were so due to the projects’ designs and not because of Ethereum itself. 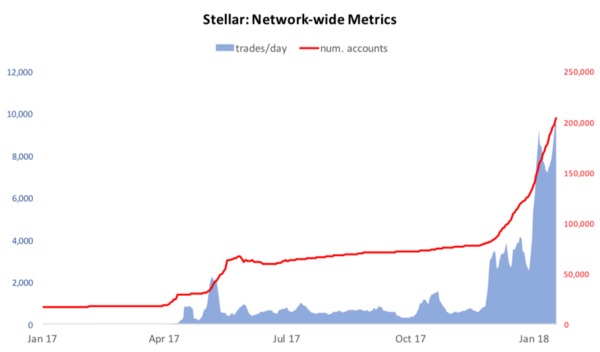 Stellar showed two network metrics: daily trades and number of accounts. Both have grown YOY. However, it doesn’t look healthy as both spiked in the last two months; daily trades spiked from around 1k in December to 4k in January and to 10k on end of January. This equals a monthly increase of 300% and 150%, respectively or a quarterly increase (December to January) of about 900%. The increase in num. of accounts was less steep but still significant by an increase of about 80%. Whereas these figures are impressive, caution is required. Firstly, the num. of accounts are total accounts and not necessarily active ones. Secondly, the fact that prices and network metrics rose similarly steeply lets me hypothesize that the increased network metrics — especially trades — arose from interest in ROI rather than technology. Finally, and maybe the most worrying aspect are the expectations such astronomic increases set. If this month’s performance was created by interest in returns and not technology we can expect future growth to slow. The question then is, of course, how such an underperformance will affect technological interest (e.g. will that influence potential industrial partners in their decision-making). As a side note, less future growth could certainly lead to a setback in price, but that should only be temporary and is thus of no relevance here. 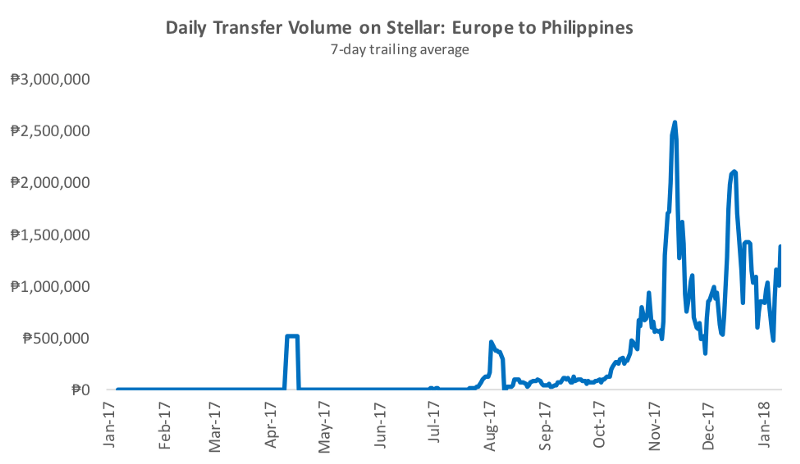 They also shared their daily transfer volume for Europe/Philippines which reached its ATH in November 2017 but started declining afterward. I wouldn’t interpret too much into these numbers due to their short time frame and lack of context (total Europe/Philippines transfer volume and transfer volume on other corridors). I will follow-up on this in subsequent posts.